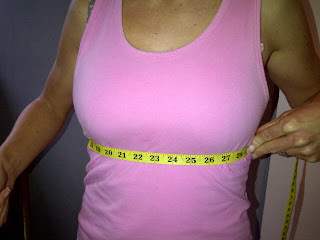 This is your easy Step by Step on How to measure yourself for that perfect fitting bra. 2. Put you bra on (this does not have to be a perfect bra just one that sort of holds your bust in place). 3. Measure Directly under the bust. This is where the Breast meet the tummy not your waist. If your breasts have a drop hold your breasts up by lifting the bra straps so that this area is exposed. Alternatively you can tighten your straps. However if your bra is too big (in most cases) your breasts will simply fall out the bottom. Take your measurement in inches and send these two measurements to expert@lizaclifford.com with "Please send me my bra size" in the subject line. The two measurements in Inches in the body of the email.